Cream to Off-White Pages and CGC 9.0. Editor's reply: This is an excellent find. It's already been graded, so it's much easier to place a value on this desirable comic. When they sell, which is rarely, they usually go for around $3,000-$4,000. It's hard to accurately pinpoint the value, because so few reach the market. You can use this link to check for them on eBay -- none were listed when I wrote this, but it's a very active market, and new comics come online all the time. Good luck with it. It's not a slam-dunk to sell, but you should find a home for it in time. Hi,I have a good collection MAD magazines.I have the super special number 12, which has the,'Nostalgic'#2 MAD comic book still in the magazine. "MINT" never seen The light of day!! 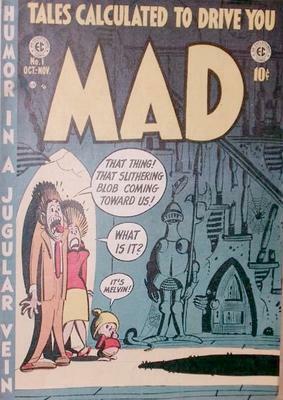 Mad originally was a comic book, not a magazine. Due to government pressure, it became a magazine. Public opinion was that comic books were ruining our kids minds, kinda like video games today.